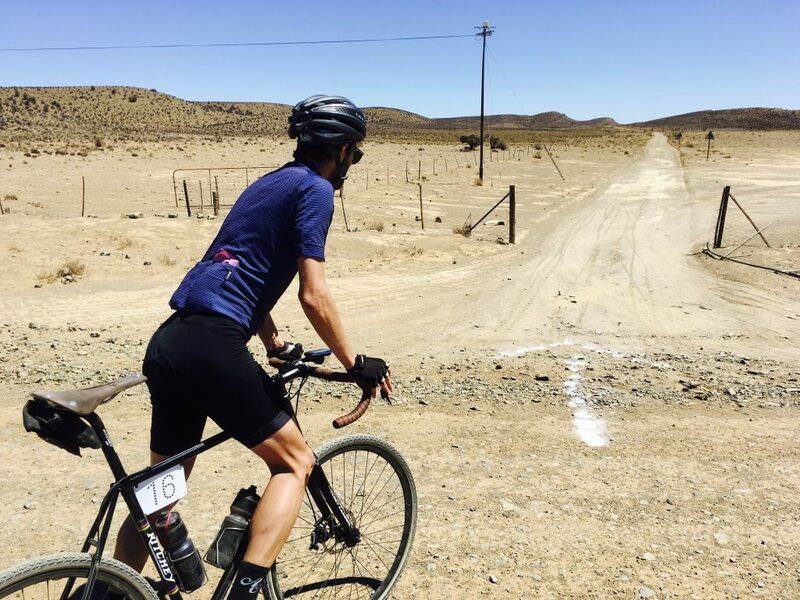 KAROOBAIX is a two-day 395km stage race for modern gravel-style bicycles through the South African Klein Karoo, and the first edition was held on 9 + 10 October 2017. The name KAROOBAIX (pronounced ka-roo-bay) pays homage to the murderous European Classic that earned itself the nickname Hell of the North, and with this spirit, Karoobaix sets out to challenge riders through the unique, spectacular and sometimes inhospitable desert of the Western Cape. 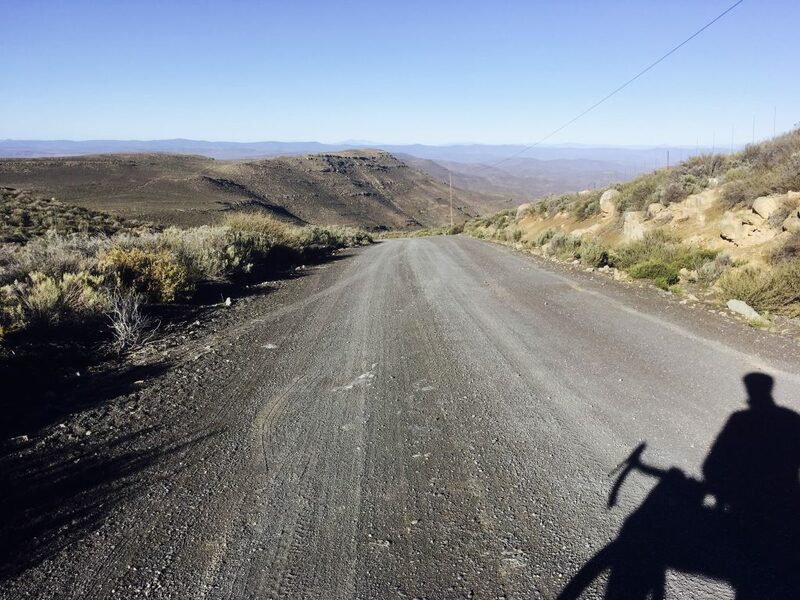 Having ridden in the Karoo last year, I knew a little what to expect: the course would be at times corrugated and rocky, and since it’s mountainous, there would be plenty of high speed climbs and descents. With two stages, 221km and 175km, comfort is also a factor, and I was going to ride with John from the Radavist so I decided to put together a new bike. Enter the Standert Erdgeschoss. Handmade in Italy from Columbus Life tubing paired with a massive 3T carbon fork, and looking “the business” with its retro paint scheme reminiscent of Moser frames from the 90’s, the Erdgeschoss promised flex and comfort for long, hard days in the saddle. 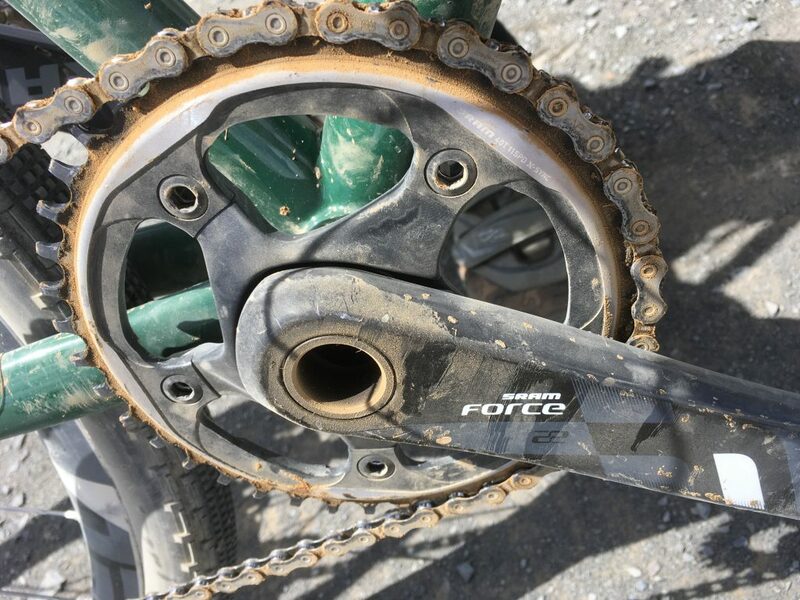 I was running short on time as usual, and Peter performed a minor miracle transferring components from my Niner RLT-9 AL whose ultra stiff, unforgiving ride I would not miss at all. Not to mention the RLT had a 2x setup that didn’t get much use when gravel grinding. Instead we went for a 40-tooth SRAM 1×11 (11-36) with Force cranks paired up with a mix of Rival components. To make it roll, we used the sturdy aluminium American Classic Argent 700c Tubeless wheelset strapped up with Panaracer Gravel King SK 43mm tyres which left plenty of clearance for mud, not that there would be much of that considering the drought. Finally we finished it off with a Brooks Cambium C13 145 and Brooks Rubber Bar Tape, of course, and the Erdgeschoss was ready for the flight to Cape Town. Karoobaix was billed as more of a ride experience than a race, and the fun began in the courtyard of Woodstock Cycle Works, the hub of cycling social activity in Cape Town. Shop staff were busy loading trailers, making coffee, and handing out starter packs to the riders, most of whom came from Cape Town, Durban and Johannesburg, though there were 7 international riders from the 45 participants. 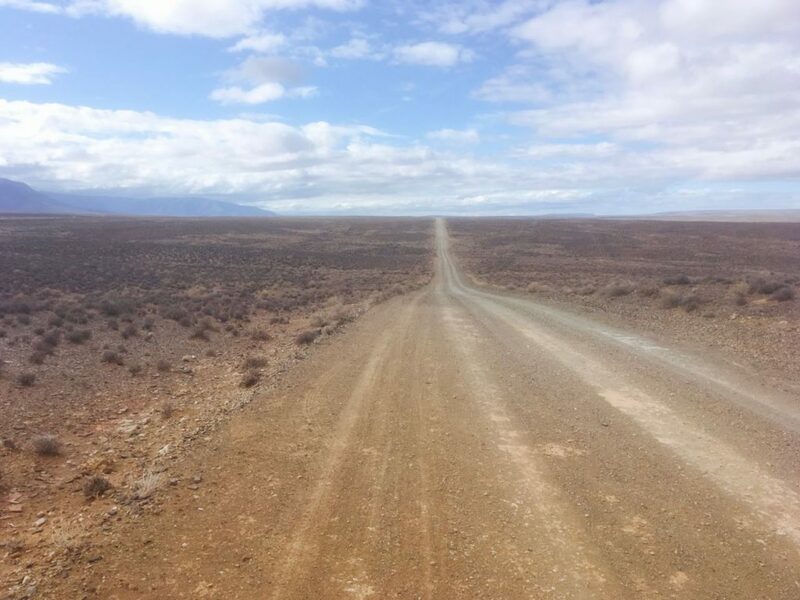 Two buses outfitted with trailers would take this group 4 hours and 1000m up to Calvinia, a quiet village at the north end of a mountainous area between the Cape and the Great Karoo desert, the Little Karoo. On the ride there, I sat crammed in the back apprehensively listened to friendly, but noticeably fit-looking south africans who passed the journey comparing their ultramarathon and triathlon times which made it seem more like a race than a ride after all. 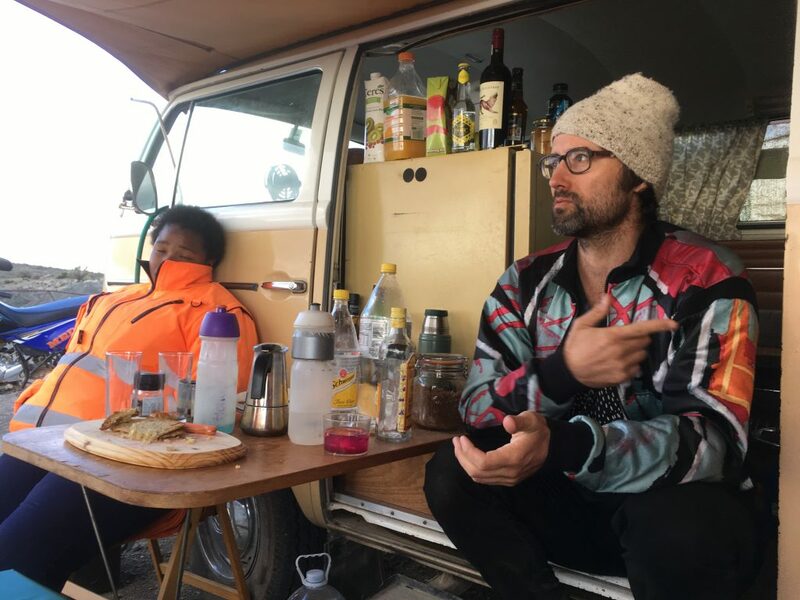 Upon our arrival in Calvinia, we were assigned rooms in a quirky motel and led to an outdoor dinner with a huge spread of local food: lamb roasted on the “Braai”, fresh baked bread, diverse salads and local wine. We each received the course map for day one along with a cotton jacket in pale pink with the race logo, a tradition of organiser Stan Engelbrecht, who is known for handing out custom apparel at his other event, the Tour of Ara. We were entertained by a few speeches, and got to know each other. At only 9pm though we hustled off in the pitch dark in twos and threes to make final preparations for the 4am wakeup call. At 5am I stood in a windproof jacket, leg warmers and light gloves with 45 other riders in the hotel parking lot/start line waiting to receive final instructions. I had mounted an Apidura saddle pack to stow clothes, extra water, food and tools. The field was mixed, with a couple ex-european pros, various ZA industry folks, and international cycling celebrity John Watson with his flat bar 650b and massive handlebar bag housing 25lbs of camera equipment. The mood was casual. After a memorable start in the pitch dark, we soon hit gravel and rode in that mystical tunnel of light created by the dust brightly reflecting from our headlamps. Then, after 15 minutes or so, the pace started to quicken and just then my chain came off. I raised my arm and calmly waited for the riders to flow past, watching as their red lights shrank into the distance. As it was still pitch dark, I had to fumble quite a bit to get the chain back on, before remounting, setting to work to reel the bunch back in from last place. After some kms I came across two bottles lying in the sand and stopped to recover them, stuffing them in my jersey in the hopes I would soon find their owner. It is a rule that you must stop and pick up anything left by other riders, including trash, and when it comes to such rules, I follow. One by one I started overtaking riders but had lost sight of mass of red lights at the front. I stopped to remove the bottles from my jersey, stowing them away in my pack. The sun was about to break over the horizon and I stood alone for a moment in the quiet desert, watching how the barren mountains on my left towered over jagged canyons cutting into an endless-looking plain to my right. 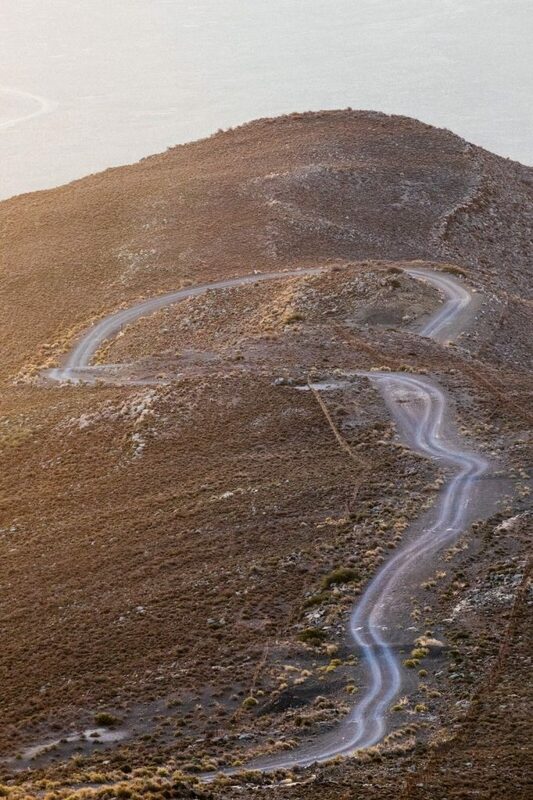 The sun began to rise, so I carried on and rode into the day up a long, smallish pass followed by a long descent, occasionally passing another rider, slowly leaving the mountains behind as I carried on into a great, flat semi-desert. 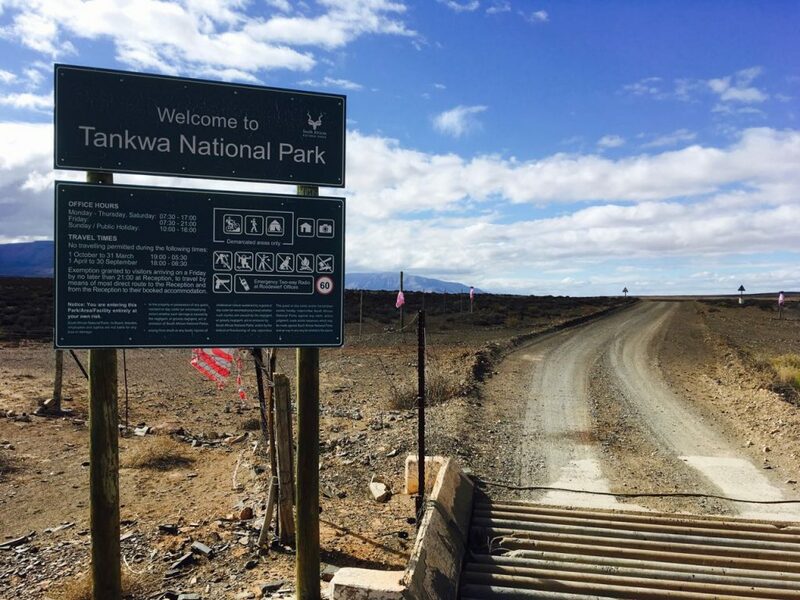 The Tankwa is barren and majestic, but its sandy, corrugated roads combined with a cold and steady headwind for some tough going that required a lot of concentration. After waiting for a troop of baboons whose enormous leader lumbered slowly out of the road in my way, I stopped for some water at a park outpost and chatted with the receptionist. I left and after awhile I could finally see some riders I knew way up ahead, guys whom I would be off with on a bikepacking trip in the days following the race. It took some time, maybe 30min, but eventually I latched onto the back wheel of the last rider and went for a drink, only to notice that both of my water bottles were missing! Without thinking, I screamed obscenities. This came as a shock to Cameron, who had no idea I was there, causing he and the other riders to stop and see what the problem was. Over the howling wind and Plastic Surgery Disasters blasting in my headphones, I cursed about water bottles and, without explanation, turned and pedaled off. Those two bottles I had recovered earlier unfortunately did not contain water, but chocomel and a sweet carbo drink. I was going to need water. I rode back about 3km and found my bottles on a bumpy descent. Always remember to give your metal cages a fresh bend during a bumpy ride, or use a camelback like the smart gravel professionals, I told myself. By now I was obviously pretty far behind and at 140km it was clear I needed to reduce my pace if I wanted to finish. The wind was blowing incessantly, the corrugations relentless, the sand unavoidable. It was beautiful country, but monotonous riding. I met a slower rider who to my chagrin seemed to be having the day of his life, sharing without malice his newly found love of cycling and the fact that he only started training recently. He offered me potato chips and smoked fish to eat, to which I declined. Then he dropped me. The going was incremental. The sun was hot but the wind cold and incessant. I was out of water. A mountain range loomed in the distance, huge and ragged with switchbacks. I thought “no way are we going up there!” I fantasized about a low pass, hidden somewhere around a distant bend. The top of my knee had been bothering me for hours from pushing through sand and wind, and when I reached the start of the climb I guessed it was 400 meters vertical to the top and the grade was steep to not ridable. I stood and cursed. I had never abandoned a race before, but with climbing this mountain, and an additional 45km after to the finish I knew this would most likely be my first time. Others arrived in a similar state. We cursed some more and discussed what do. In the distance I could see Watson coming so I decided to wait. Darker clouds moved in and I felt cold drops of rain. Finally Watson arrived but with bad news – he had reactivated a knee injury and was sure he could not continue, including our bike packing trip which was to begin following the event. We decided to walk up the mountain. The walk was long, steep and relentless. We took turns bitching, pushing John’s heavy bike, and talking about the landscape. At some point a cold rain started again but thankfully passed. We shivered as the altitude rose. A 4×4 passed and assured us we were almost there. We trudged on for what seemed like a long time more. 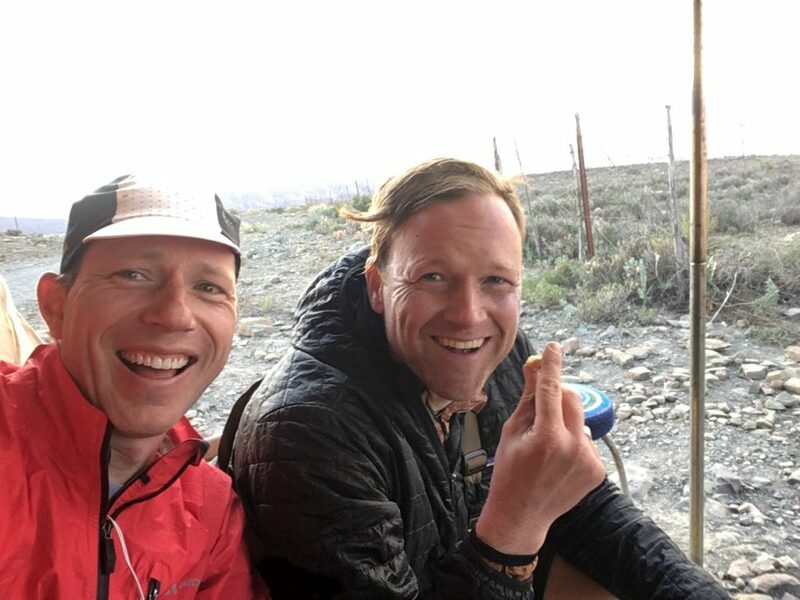 We reached the top and the last checkpoint before the finish where Nic waited with his T2 and usual gourmet bevvy of food and drink. 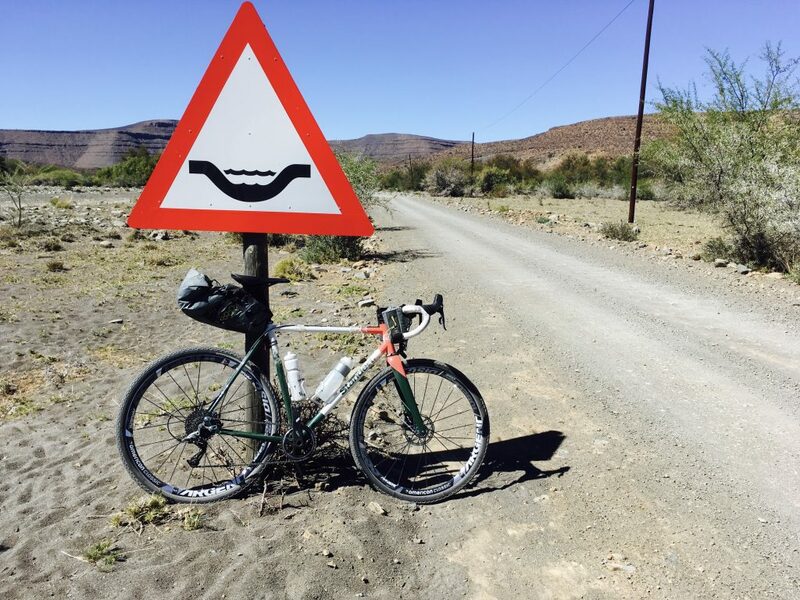 This oasis is well known to anyone riding the Tour of Ara, Eroica South Africa or Karoobaix. I wrapped myself shivering in a blanket and tried to eat. Someone handed me a fancy gin and tonic. It was surreal. Suddenly after so much desperation we were safe, the climb was over, and the vibe at the bus warm and friendly. We laughed and bitched some more. The sun was getting low and we decided not to carry on. I am not a fan of suffer challenges, or at least not ones I didn’t sign up for. Our photographer was broken along with my photo plans for Brooks England. We rode back in the dark in a race vehicle through herds of sheep swarming the hilly, corrugated road. I didn’t regret my decision and still don’t; the truth is I could not continue. I had eaten regularly, I had tried not to overcook myself. I maybe could have trained more in the weeks prior but felt that wasn’t the reason. I didn’t bonk. I was just beaten. As we arrived to the hotel all I wanted to do was sleep. Most everyone was completely and similarly wasted. The mood was dour. I sat by the fire, ate joylessly and tried to drink a beer. I left to my room without saying good night, showered and curled up exhausted in my sleeping bag on top of my bed, still shivering from exhaustion, and chatted with John briefly before passing out. I said I would not ride in the morning but instead join the others in the van ride to the finish in Matjesfontein, which honestly sounded like a really appealing place to spend a day. 9 or 10 riders had dropped out. In the back of my mind I knew though, that this abandon probably wouldn’t happen. My alarm woke at 5am and I got up and mechanically put on my riding kit. John came in from getting a coffee and asked if I was riding to which I grunted, gathering my things to go find my bike. The temperature outside in Sutherland that morning was -2°C. The hotel foyer was cold and filled with spotlessly clean bikes. I remember giving my bike to someone the night before, but I had only asked if they could lube the chain, so seeing my cleaned and lubed bike brightened my mood considerably. We collected outside under bright, clear skies. I noticed some of the riders were very lightly dressed. Eventually they would warm up, but they had at least an hour of bone chattering riding ahead, and I for one did not feel sorry for them. I decided that today I am racing, not riding, and I will enjoy the suffering of others. We were to ride 15km on tarmac before starting the gravel, and it was a refreshment to do some pack riding. Nils from Woodstock Cycleworks remarked at the frost covering the landscape, which he could not remember the word for. After 7km the first break occurred, with about 1/4 of the riders going. I could have followed but did not want a repeat of the day before and knew anyway that would be a short-lived escapade. I sat at the front of the second group and took turns with two guys from Durban and one of the Flamingos from Joburg. 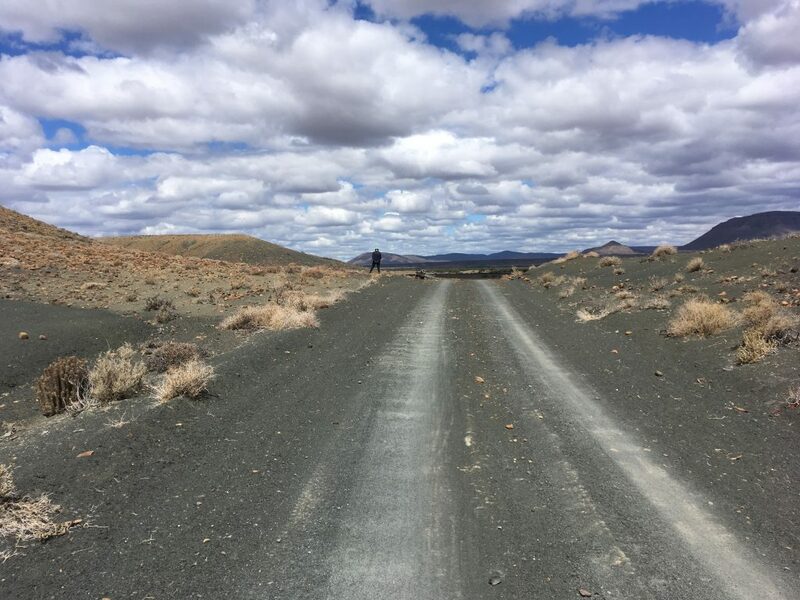 We turned off to the gravel, but this time instead of headwind and corrugations there was a neutral wind and wonderful, black, shiny, smooth gravel! What I came here to ride! One of the Durban guys was intent on hammering at the front so I tucked in at third wheel behind his enormous buddy and enjoyed slipstream for the first time in 200km. After a while I glanced behind me and noticed I was in a break, which was great because I had hardly put in any effort. It wasn’t long after that the big man providing my windscreen peeled off, as did his buddy at the front with the pineapple calves. (I found out later the one had a bad knee.) I looked round again to see we were now only two. It went on like this for a while, trading places and almost coasting over hill after hill. The other rider upped the pace and I let him go. I didn’t want to kill myself, and most importantly I needed to finish. Finally we reached the start of a massive descent so I stopped to make a video and take some pictures. A small group of riders caught up to me, among them race organiser Stan Engelbrecht, who I admire greatly but with whom I was not yet capable of addressing after the forced march hours before. That being said, I was having one of the best rides of my life at this point. We were crossing through a lot of grazing territory, and though it is proper form to always shut the sheep gate behind you, even if you see another rider coming, at the first gate I was gracious and waited and let the other riders through. At the second gate though, the gap was big enough that I shut and fastened it completely, fully, and as tightly as possible. I know this is ridiculous since I was not in the top ten, but feeling like it’s a race does powerful things to the mind, charity not being one of them! Mostly I rode alone the first 100km, though I spent a memorable 10km riding with a relentless man/ woman duo on matching OPEN bikes who rode like water wearing down a mountain, never giving an inch, and with such souplesse it was all i could do to try and pay attention while admiring them. We chatted a bit and it felt good to keep up with such a pair, who finished 8th and 9th by the way. Eventually I stopped to take off my warmer clothes and said goodbye, but it would not have been long before they had dropped me anyway. 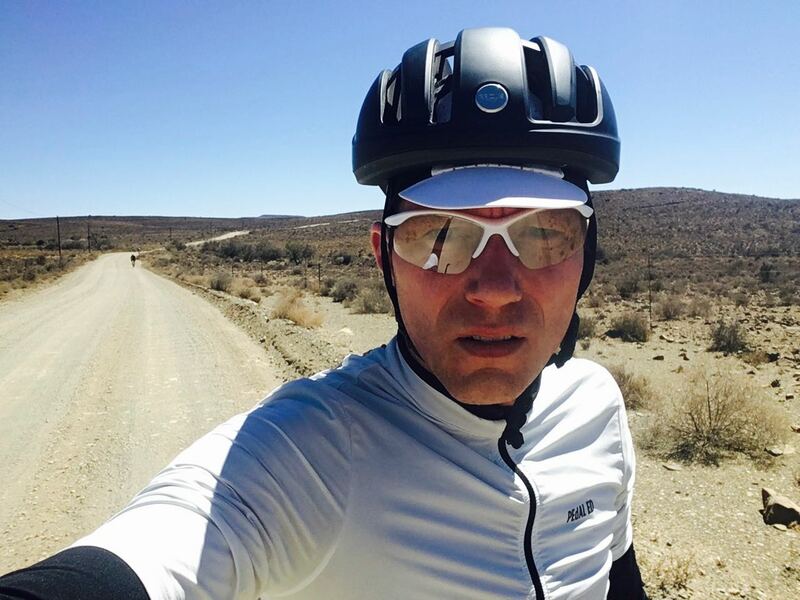 Around about 120km I was busted from behind taking a selfie by two fast riders from the Joburg Flamingos and, after some time trading blows, it was clear we were matched to ride together. The roads straightened out and became very white, and for some time our pace hovered around 40kph. 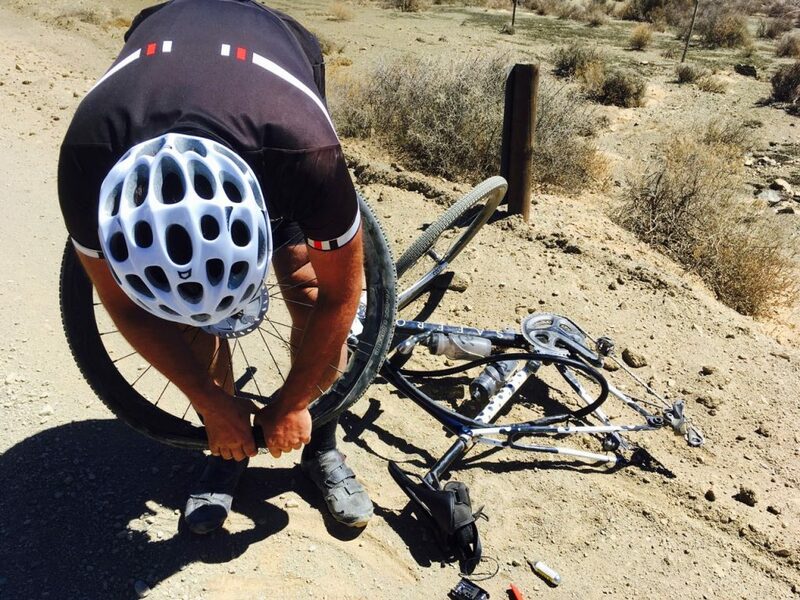 We came across Matt Sowter of Saffron bikes who was dealing with his second puncture of the day. That he had spent at least 20min on the side of the road and I am only now coming upon him says a lot about how well Matt rides his bike. After helping with his puncture we rode into the second food stop, decorated with colourful umbrellas, friendly faces, and an impressive array of food and drink. The highlight were stuffed sandwiches made form fresh bread baked on the grill, washed down with homemade pineapple soda. I inhaled one of avocado and egg, changed out of the last of my warm clothes, and applied fresh sunscreen. One of the flamingos, Gilles, deigned to ride with me (I’m convinced he could have dropped me anytime) and we set off to finish the last 45km together. Riding exposed in the hot sun, the next kms were mostly flat, with some ups and downs, a headwind, and lots of loose sand so it wasn’t easy going. Almost to Matjesfontein, with about 7km to go, I had to watch helplessly as Gilles pulled away. Still, we had run into Liam the photographer shortly before, who claimed the next rider was very far back so I was not too worried, and set about finishing the race. I had been having acute pins and needles in my feet and was very uncomfortable on the bike. My feet felt like they were on fire. A bike race can also be interesting for mere mortals, and about 4km from the finish I noticed another flamingo gaining on me fast. I used every trick I know to maximise my meager speed and wondered if I could hold out. Finally I reached the tarmac and started the descent into Matjesfontein. Descending is a stronger point of mine. I tucked and sailed into town, high-fiving two local kids along on the way, turning left to where I hoped to find the finish. I saw Nic’s T2 and crossed a line chalked across the street. I stood there wondering where everyone was. As it turned out, most were still riding. I had come in 14th! 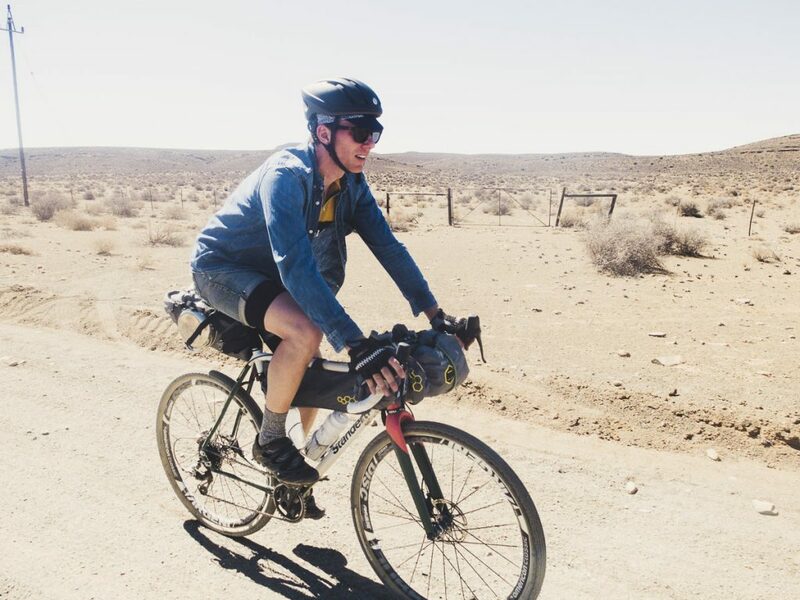 The following day, seven of us set out on a tour to die Hell, documented by David Malan on the Everyday Cycle Supply blog The race itself was covered with amazing images by John Watson on the Radavist so go check that out too. Some more about the bike over at the Standert Blog. Thanks finally to Apidura, a blog will be posted soon over there. Lastly, the race happens again this year, so check out the Karoobaix page for more details.